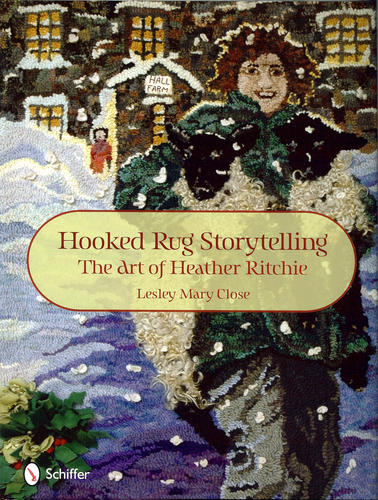 Heather Ritchie has been making rag rugs for forty years but you wouldn’t want to walk on them: these are works of art to hang on the walls. A colourful new book about Heather’s life and work, Hooked Rug Storytelling: The Art of Heather Ritchie by Lesley Mary Close, was published in the USA in April this year and its UK launch will take place at the Swaledale Museum. Speaking from her home in Amersham, Bucks, Lesley said “I am thrilled that this launch will take place in one of my favourite places, a real gem of a museum.” Helen Bainbridge, owner of the museum in Heather’s home town of Reeth, North Yorkshire, says she has been forced to chain the book to her desk to stop people stealing it! Heather and Lesley will spend Tuesday June 28th at the museum, signing copies, and all profits generated from sales of the book on the day will go to support the museum’s work.